When President Trump proposed zero trade barriers among major economies, I applauded. Government-imposed barriers to commerce hurt prosperity, whether those restrictions hinder voluntary exchange inside a country or across national borders. There’s a debate over Trump’s sincerity, and I’m definitely with the skeptics (look at his supposed deal with Mexico, for instance), but let’s set that issue aside and investigate the merits of free trade. But let’s go one step farther. Instead of looking at whether multiple nations should simultaneously eliminate trade barriers, let’s consider the case for unilateral free trade. In other words, should the government abolish all tariffs, quotas, and other restrictions so that buying products from Rome, Italy, is as simple as buying products from Rome, Georgia. The global evidence says yes, regardless of whether other countries do the same thing. Consider the examples of Singapore, Macau, and Hong Kong. According to the World Trade Organization, trade barriers are virtually nonexistent in these jurisdictions. Hardly. According to the World Bank, all three jurisdictions are among the most prosperous places on the planet. Indeed, if you removed oil sheikdoms and tax havens from the list, they would win the gold, silver, and bronze medals for prosperity. To be sure, there are many reasons that Singapore, Macau, and Hong Kong are rich. They have low taxes and small government, as well as comparatively little red tape and intervention. But free trade definitely helps to explain why these jurisdictions have become so rich at such a rapid pace. Let’s also look at the example of New Zealand. It doesn’t have absolute free trade, but average tariffs are 2.02 percent, which means it is the world’s fifth-most pro-trade nation. Have the Kiwis suffered from free trade? Nope. I shared a remarkable video last year that explains the nation’s remarkable turnaround coincided with a period of unilateral trade liberalization. Today, let’s look at a column on the same topic by Patrick Tyrrell. New Zealand…is one of the champions of economic freedom around the world. But it wasn’t always so. In the mid-1980s, New Zealand was facing an economic crisis, with its domestic market and international trade both heavily regulated. Unemployment had reached 11 percent… In response, the government of New Zealand began implementing revolutionary economic reforms, most significantly related to trade policy. It announced in 1987 a program that would reduce the tax on imports to under 20 percent by the year 1992. By 1996, that tax was reduced further to under 10 percent, and by the end of 1999, about 95 percent of New Zealand’s tariffs were set at zero. Was that a successful policy? 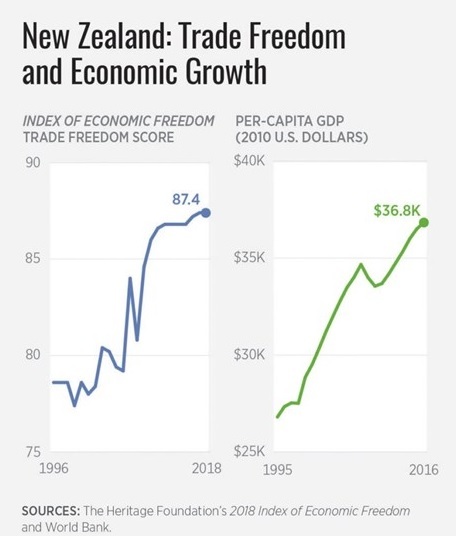 New Zealand’s adoption of less restrictive trade policies has corresponded to its climb up the trade-freedom scale…and with a huge boost in per capita gross domestic product. The United States could take a page out of New Zealand’s trade-policy book and implement the same type of reductions in tariffs… That would enhance innovation and economic freedom—and grow our economy. Here’s the chart from Patrick’s column. Once again, the obvious caveat applies. New Zealand has adopted many pro-market policies in recent decades, so trade is just one of the reasons the country has moved in the right direction. Now let’s go back in history and peruse Professor Peter Cain’s analysis of what happened when the U.K. adopted unilateral free trade in the mid-nineteenth century. The trend to freer trade began in the late eighteenth century. …it was the 1840s that saw the beginning of a true revolution in policy. Earlier moves towards freer trade had been conditioned by an insistence on reciprocity (i.e. agreements with other states on mutual tariff reductions), but from the 1840s policy was determined unilaterally. The most dramatic instance of this was the Repeal of the Corn Laws in 1846. …It also reflected a growing belief that cheap imports were the key to prosperity because they would benefit the consumer as well as reduce business costs… Free trade certainly became a hugely popular cause in Britain… It was attractive not only because it guaranteed cheap food, but also because it supported the belief, widespread amongst both the business class and their workforce, that the state should be kept out of economic life. What was the impact of this shift to unilateral free trade? …free trade, in combination with heavy foreign investment, certainly helped to change the shape of the British economy in the late nineteenth century. …the long run effect of unilateral free trade had been to increase competition for British agriculture and industry, lower profits and stimulate capital exports. …this regime had yielded great benefits. British capital, pouring into foreign railways and other industries overseas, had helped to reduce agricultural commodity prices, shifting the terms of trade in Britain’s favour and raising national income. Dividends and interest payments on foreign investments had also increased greatly and these returns were realised by importing cheap foreign produce freely. 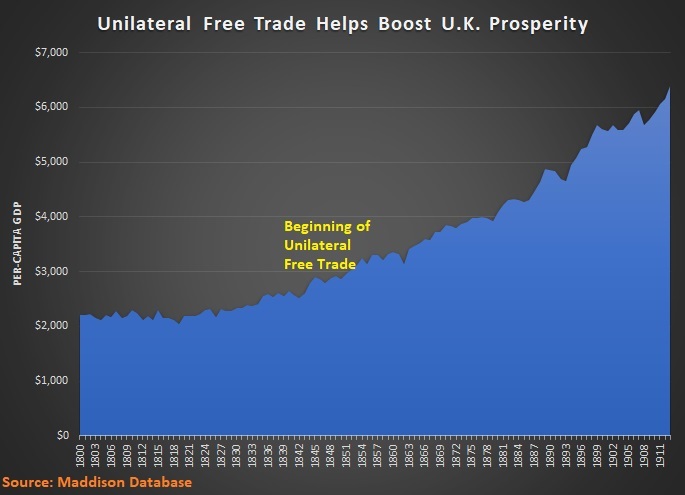 Furthermore, …this unilateral free trade-foreign investment system had provided a strong boost to Britain’s commercial and financial sector. Here’s the Maddison data on per-capita GDP in the United Kingdom between 1800-1914. Looking at this chart, I’m wondering how anyone can possibly argue that unilateral free trade hurts an economy. Once again, many caveats apply. Most important, many other policies play a role in determining national prosperity. It’s also worth noting that a handful of tariffs on products like wine and tobacco were maintained. Most troubling, the era of unilateral free trade coincided with the imposition of the income tax (though it didn’t become a money machine for bigger government until the 1900s). The bottom line is that every example of unilateral free trade (or sweeping unilateral reductions in trade barriers) tells a positive story. Trade liberalization isn’t everything, but it’s definitely a huge plus for growth. Yes, the best of all worlds is for trade liberalization to happen simultaneously in all countries, and negotiations have produced considerable progress since the end of World War II, so I’m somewhat agnostic about the best strategy. But there’s no ambiguity about the ultimate goal of ending protectionism. P.S. Sometimes bad things happen for good reasons. The income tax in the United States also was adopted in part to offset the foregone revenue from lower trade taxes.